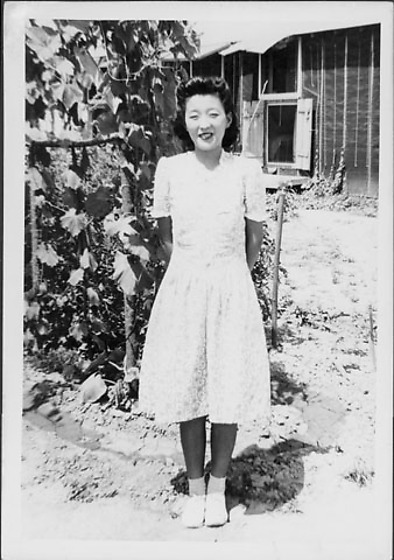 Full-length portrait of a thin woman in a white spiral-patterned dress standing with her hands behind her back in front of a trellis with climbing vine at Rohwer concentration camp, Rohwer, Arkansas, July 9, 1944. She smiles and looks directly at viewer. Barracks with chimney in background R. Image has irregular scalloped border. Same woman in 97.292.6AV, 97.292.6AW, 97.292.6BD, 97.292.7T. Larger image of 97.292.6AW. Stamped in black ink on back: JUL 9 1944.